The club has five floodlit hard courts. The clubhouse overlooks courts 1, 2 and 3 and courts 4 and 5 are located off to the side. There is a hitting wall located at the back of Court 4. Except during advertised times when club sessions and events have priority, the courts are available for use by members and their guests from 8am-9:30pm daily and may be booked online up to 7 days in advance. 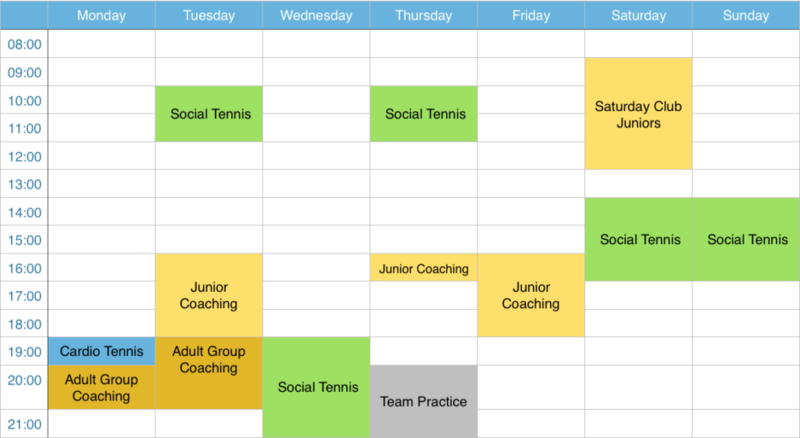 Social sessions use courts 1-3, as does Saturday morning coaching. Weekday coaching and team practice uses courts 4 & 5 only. Outside of these sessions, courts may be reserved for team matches or tournaments, please check the online booking system for availability. Members may use the system to reserve courts up to 7 days in advance. Floodlit play is available on all courts until 9.30pm for a nominal fee of £1 per half hour.